“Building the Gearbox” took first place in the 2013 photo contest. 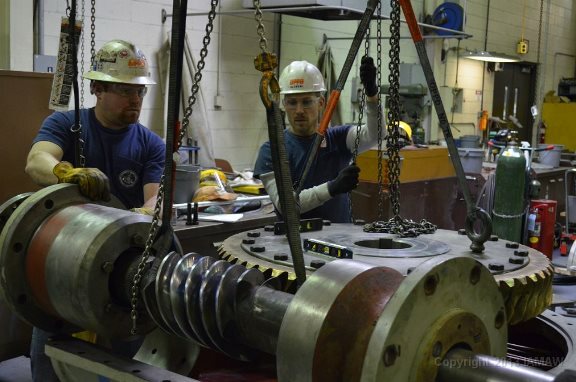 Here, Local 31 Journeyman John Stroy and Apprentice Kirk Allen rebuild a coal mill gearbox at the Omaha Power District’s North Station. Photographed by Michael Milledge, Local 31, Omaha Public Power District, Omaha, NE. There’s still time to enter the 2014 IAM Photo Contest. The entry deadline is May 9, 2014. There is no fee for participating in the contest. Winning photos will be announced in the fall of 2014 and will be featured in the 2015 IAM Calendar. Photos should be of IAM, TCU or NFFE members in good standing and taken by an IAM, TCU or NFFE member in good standing. Click here to view the 2013 contest winners. Download your copy of the official call and registration forms.